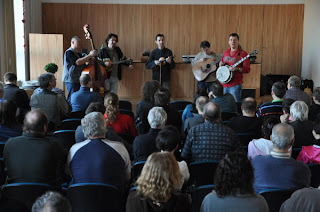 The 6th Annual Winter Bluegrass Workshop, organised by Petr Brandejs in Novy Jicin (eastern end of the Czech Republic), ended on Sunday 6 March. Eighty students were taught for two days by the cream of the crop of Czech instrumentalists. Bluegrass Cwrkot opened the Saturday night concert in the local theatre; the second half was taken over by the ten instructors playing bluegrass as well as Tony Rice's 'Backwaters' and other new acoustic stuff. The audience loved the mix as well as a very friendly atmosphere, which can be seen on more pictures here. The 16th autumn workshop is scheduled for 14-16 October 2011.